I really love my job, but I am extremely jealous of whoever does the music placement for Democracy Now! (It's an independent news show, should you be curious. They're are very unapologetically left-leaning if that's your thing.) During commercial breaks, the music coordinator plays music relevant to the upcoming segment, though they often have a sense of humor about it. I use it to learn about a new music. The other day, a powerful protest song came on. I grabbed my phone to write down the artist's name, though it sounded familiar. 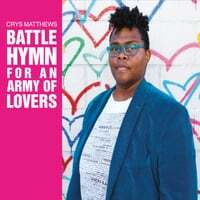 Turns out it was Crys Matthews' "Battle Hymn for an Army of Lovers," which has been sitting in my "to review" pile for a criminally long time. Tracy Chapman may sound like a lazy comparison, but I think it's a valid one: Matthews shares her direct songwriting approach and delivery; her intricate guitar patterns bring to mind Ani DiFranco. Following in both songwriters' footsteps, Matthews' EP is a fantastic collection of protest music, sure to bring a balm to the hearts of everyone weary of the onslaught against minorities' rights under Our Dear Leader. What strikes me most about Battle Hymn is that, in some ways, it's a pretty happy album. I think a lot of the time protest music comes from a place of anger and fear, which can be wearing. But Matthews' work -- I highly encourage you to listen to her other recent release, The Imagineers -- is imbued with love. Not squishy romantic love, but love in the radical sense: a deep belief in human goodness and a worldview that seeks to bring that goodness out of people. It's this love that elevates these songs that would, in lesser hands, sound cliche or insipid. Battle Hymn For an Army of Lovers is required listening for all of us. Crys Matthews will be featured on today's podcast! Thanks for listening and help Von and me help you find great music by contributing to our Patreon or Ko-fi!